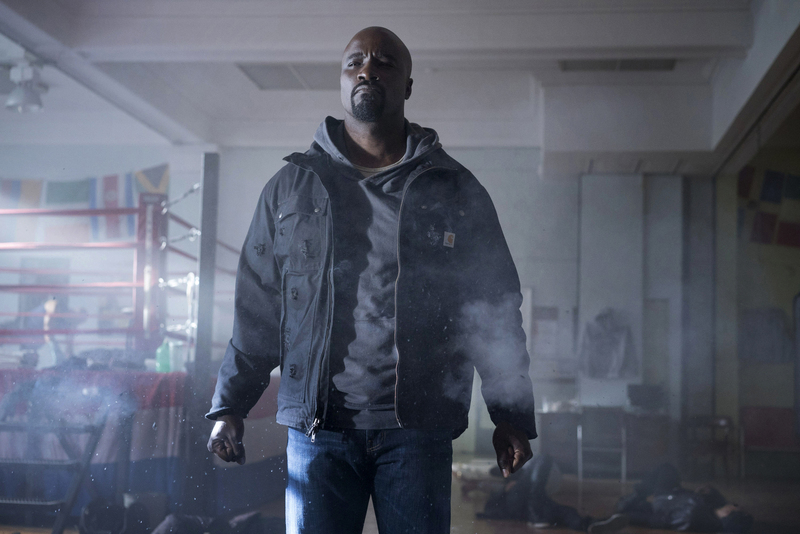 My A to Z Luke Cage Review. 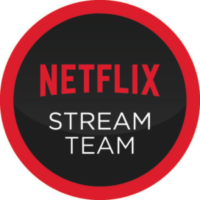 A Netflix StreamTeam post. Let me start off by saying I love superhero movies. LOVE them. But as I’m not a very big comic book fanatic, I’ve only heard of the big hitters (e.g. Spider-Man, Superman, Xmen etc) and only heard of others as movies about them come out of Hollywood and TV series. But I’m a sucker for a superhero so I always watch them. 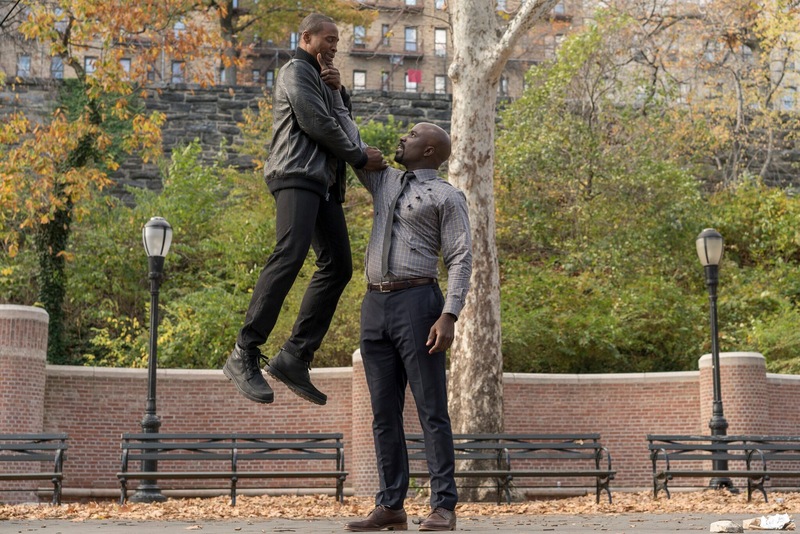 I watched the Netflix original Jessica Jones when it came out, and was introduced to Luke Cage then, so when he was given his own Netflix show, of course I was going to watch it. The message permeating through Luke Cage is so important. One of the images that stands out, episode after episode, is Luke, in a bullet hole covered hoodie. When we place this against what is happening in America at the moment, with black unarmed men fatally shot nearly on a weekly basis, is important. There is a wide kaleidoscope of black men and women that reflects the variety of life the media seldom portrays. In a reality where a black man or woman can get shot and killed for little reason, what would they give to have bullets bounce off them? What would they give to walk away unscathed from any contact with the police? There is a scene in episode twelve that speaks so loudly to this that my heart nearly stopped. Yes the pacing was a bit poor and the script could have been better, but it had superb acting. So here’s my review. I promise to put spoiler tags where there may be some, and hope you give it a watch. A is for Alfre Woodard. Alfie frickin’ Woodard! She still looks amazing and is a fantastic actress, stealing the show many times during this series. She’s as amazing in this as she was in the movie Mandela thirty odd years ago. B is for Barber Shop, mainly Pop’s Barber Shop, which plays a key part in the series. Barber shops pop up quite often in black African-American film so I looked up their importance and found a number of books that I now have in my wish list. D is for death. Surprisingly few people die in this. Give the number of henchmen most villains tend to surround themselves with, very few of them die here. The few deaths that do happen are significant and help to move the story along. E is for Ego. Why do all villains have such big, terrible egos? Like seriously? There are three official baddies in this – the last one is so crazy you could put him in as a character in the looney tunes. F is for Faith. Namely Faith Evans who sings in the nightclub in episode two. Faith is the widow of the rapper Christopher Wallace, whose stage name was Biggie Smalls, Whose picture hangs in Cottonmouth’s office upstairs in the nightclub. Bit of useless information for you there. She was and still is an incredible singer. G is for great soundtrack! – I’d pay for a soundtrack to the series. The live music in Harlem’s Paradise, the nightclub owned by Cottonmouth. Faith Evans, Raphael Saaddiq, and others who I’m not familiar with but add such…je ne sais quoi to the series. 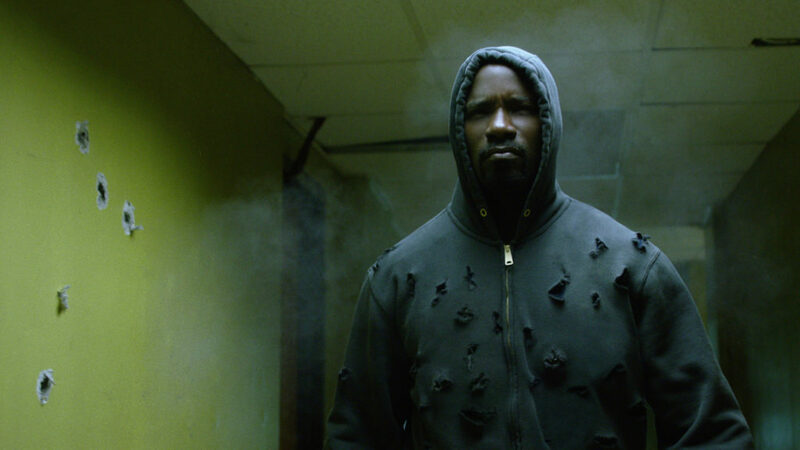 You can find out more about the music in Luke Cage here. H is for Harlem, which I’d have liked to see more of, in daylight. But alas, superheroes mostly do their superheroing at night. It felt like there only a limited number of places they shot the series in so bah humbug. It did make me want to visit there. Especially as the Luther Vandross song ‘Nights in Harlem‘ would go through me mind the whole time. I is for injuries which occur to all those who try to punch Luke. There’s the first one in the first episode which had me covering my eyes and wincing, it looked that realistic. Not to mention painful. And though Luke never actually kills anyone, a lot of people get injured. J is for Justice, which superheroes are obsessed about. Obsessed! Luke Cage is no different. Righting wrongs and such. This is in the excellent episode four when Luke is discussing who the better Kung Fu fighter is, Jet Li or Bruce Lee. You know I was wondering why he says ‘Jet or Bruce’ instead of the last names, then I got it and laughed so hard. And yes, I’m that easily amused. But it’s a critical point in the story as this is when we see Luke start to trust another person, which makes the outcome all the more tragic. L is for laugh. Most specifically The bad guy, Cottonmouth’s deliciously dark laughter that winds its way down your spine. He chuckles, he guffaws, he chortles. I dare you not to crack a smile. Have a look and a listen here. M is for the two male actors that stood out for me. Mike Colter who is superb as Luke Cage. He was authoritative, quiet and dangerous as Lemond Bishop in The Good Wife, and he’s all that, but in a good guy way, and compassionate as Luke Cage. 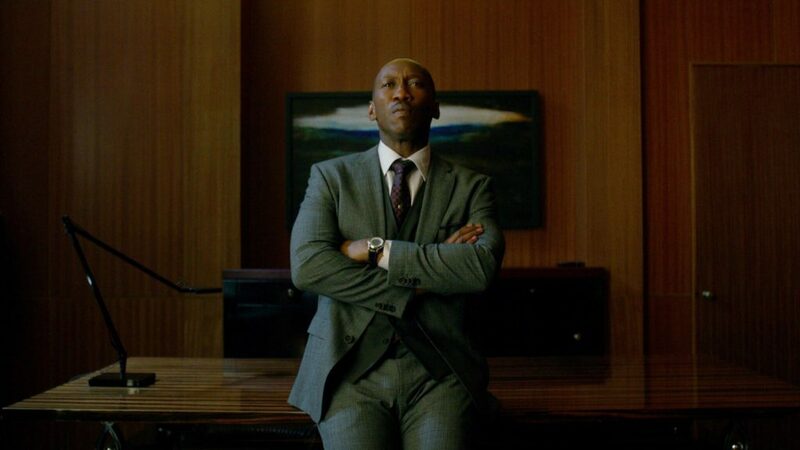 Mahershala Ali whom I just adore. From his stint in The 4400(also on Netflix if you love fantasy and sci-fi), In the Mockingjay movies, and as Remi in House of Cards. I adore him. He’s a fantastic actor who brings dignity to his roles, even when they are, in this case, the villain you’re meant to hate. Another M appears in episode 12 at about minute 18.10. and again at around 27 minutes is. This is a poignant moment and sparks an emotional montage that stands out. In any case, I dislike the word and could have done with less sprinklings of it across the whole show. O is for Opening my eyes. To a culture I hadn’t known existed in books (Luke, Pops and some of the detectives speak of writers I had to take note of and will read), The importance of Art imitating life and vice versa, and I’ll keep banging on about it – Representation on screen of people who look like me, whom I can identify with, the universality that makes superheroes still needed today. P is for Pacing. Netflix stuck with their thirteen episode formula, which is used in most of their shows. I think they should have made it twenty-two episodes and really fleshed out the characters; especially the villains, who we could have understood a bit better, and Detective Knight who’s motivations for several actions needed more time to be fully understood. So it feels rushed in many ways. Q is for quote. (After being shot at for about the umpteenth time), Luke says: “I’m about sick of always having to buy new clothes” and when Diamondback says “bye Felicia” and “sweet christmas!”. R is for two people: Ron Cephas Jones who, like Simone Missick, steals all the scenes he’s in. And Rosario Dawson, who reprises her role as nurse Claire Temple from Daredevil and Jessica Jones. 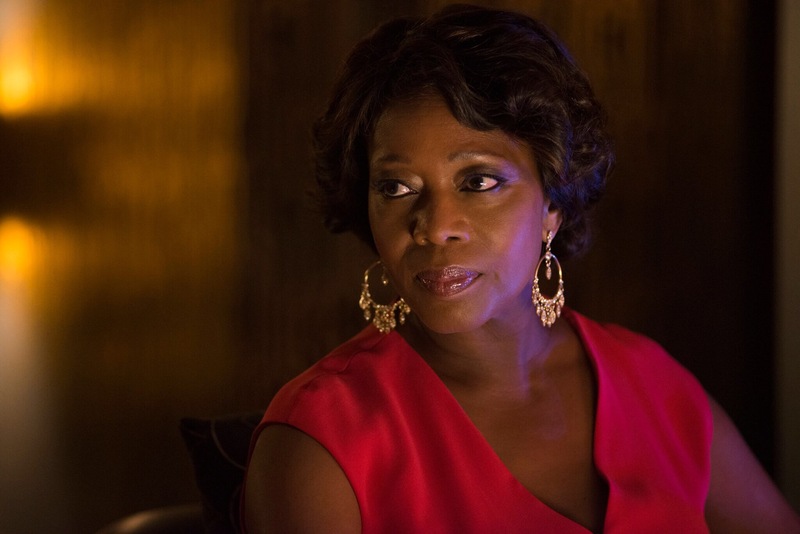 She’s more of a main character in Luke Cage, and ties the three together nicely. Though How Jessica will view this relationship remains to be seen…. 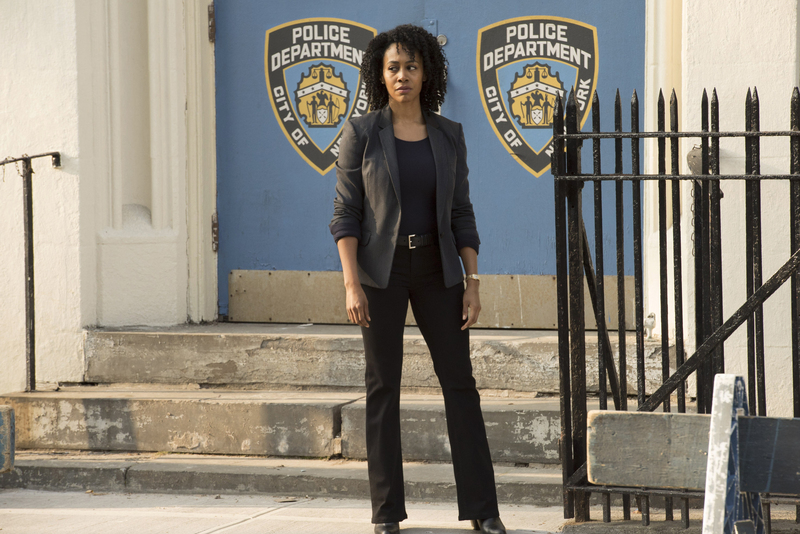 S is for Simone Missick who nearly steals the show as detective Misty Knight. She’s amazing as an actress and is so intense on screen. The plot around why she’s so intent on pinning everything on Luke could have been fleshed out more though. See P.
T is for The Defenders: Which is the superhero team comprising of Jessica Jones, Daredevil, Luke Cage and Iron Fist. To be released by Netflix next year. Can’t WAIT!! U is for unbreakable. Which Luke Cage is. As I said at the start, there’s something about seeing a black man in a hoodie and seeing him as a good guy, that America and the rest of us, need to see right now. V is for Victorious. Of course Luke wins. It’s a Superhero series, of course he does. But the question is, at what cost to him and the people of Harlem? W is for Why. Why is this series so important at this time? Look at what’s happening in America at the moment with the Black Lives Matter movement. Y is for Yellow. 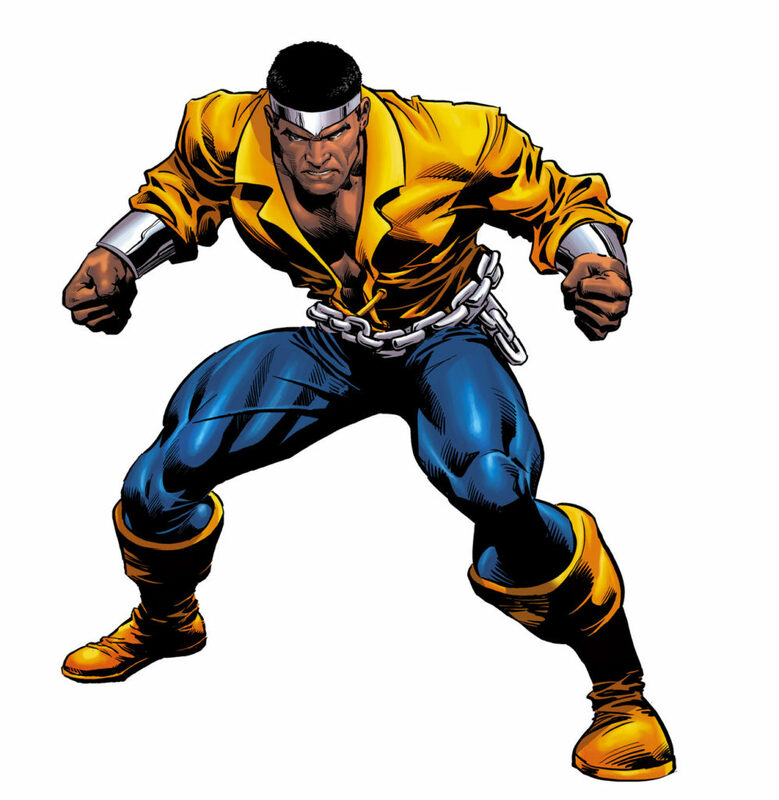 As in Yellow disco shirt, Tiara and arm bands that the original Luke Cage wore as a costume when he was Power Man in the comic books. He wears the costume, accidentally, in episode 4 “Step in the Arena, if you watch from 45.10 to 45.35 minutes in. It’s hilarious. Z is for Zzzzs, which I got little of as I binge watched all episodes last weekend, then had to rewatch a few more for this review over the last week. Totally worth it! Disclosure: As a member of the Netflix stream team, I was provided with an Appletv and one year’s free subscription to Netflix and will post regular reviews in return. However, all opinions are and will continue to be my own. I had never heard of Luke Cage before the series. I am now intrigued to watch it. I hope the works of a full length movie are being looked at. Loved this review!Just finished the series last night-would have loved to have seen more episodes but they’ve it nicely set up for season two-fingers crossed there is one! Agreeing with a lot of this-I too would have loved to have seen more of Harlem. What I also really liked about this show was its strong female leads-such a difference from Daredevil where I thought the women were all simpering and quite pathetic-though I must admit I didnt watch many episodes of this so perhaps this was rectified early on. Thanks Aedín. And yes, the female leads were just excellent. I really hope we don’t have long to wait for season two. I’m only on episode two of Daredevil….not liking it as much I’ll admit. Previous story Things I can’t do without.